Delivery to the UK and Northern Ireland only. Please call for prices to other countries. Tyre size calculators which will automatically give you the units required for your tyres are on the Technical page. Two Bottle DIY Kit - High Performance High Speed Grade for Cars, twin axle Touring Caravans & Trailers, containing enough puncture prevention to do an average size car or twin axle touring caravan. The larger cars with 15"or 16" tyres may need a third bottle (Motorcycle Kit will be OK) Contains 1.56 litres - 56 units - new bigger bottles with 11% extra free. Single Bottle DIY Kit - High Performance High Speed Grade for Motorcycles, Scooters, single axle Touring Caravans & Trailers, containing enough puncture prevention to do 2 large or 3 small motorcycle tyres or 3 to 4 scooter tyres. 780 ml, - 28 units - this is a new bigger bottle with 11% extra free. Now packaged in a new funky electric pink carton. 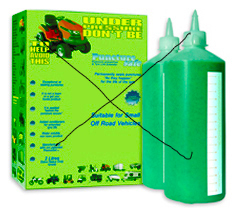 Two Bottle DIY Kit - Extra Heavy Duty Low Speed Grade for small wheeled Off Road Vehicles, containing a massive 2 litres of puncture prevention (64 units) – enough for most off road vehicles such as quad bikes, dirt bikes, ride on mowers, fork lifts, motability scooters, wheelchairs, golf course equipment, wheelbarrows and carts. This kit is unique because products are not normally boxed with as much as 2 litres. Cycle Bottle, containing 280ml, enough puncture prevention to do any size cycle. Only suitable for Schrader valves because it is not possible to inject through the narrow Presta valves. 5 Litres Heavy Duty Medium Speed Grade for HGV vehicles & for added protection in Touring Caravans & Trailers, containing 170 units. Complete with a 1 unit installation pump. 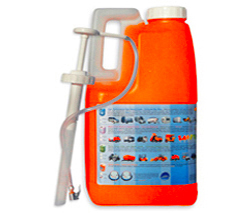 The pump supplied with this kit will enable you to install into tyres without fully deflating the tyres. Not suitable for pumping against air pressures above 25 psi. 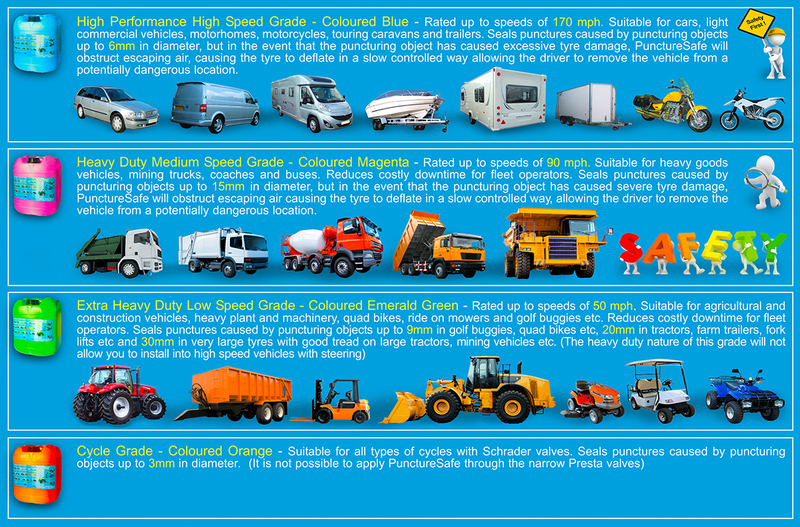 This grade is not suitable for high speed vehicles but will be suitable for touring caravans and trailers . 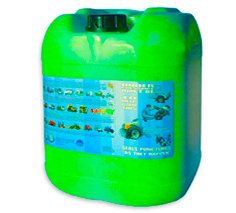 5 Litres Extra Heavy Duty Medium Speed Grade for Off Road vehicles such as quad bikes, dirt bikes, ride on mowers, fork lifts, motability scooters, wheelchairs, golf course equipment, wheelbarrows and carts. containing 170 units. Complete with a 1 unit installation pump. Not for pumping against air pressures above 25 psi. 5 Litres Cycle Grade containing 180 units, enough to treat 20 to 25 cycles, a very cost effective solution. Complete with a 1 unit installation pump. 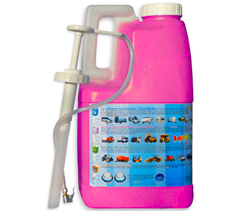 The pump supplied with this kit will enable you to install into tyres without fully deflating the tyres. Only suitable for Schrader valves because it is not possible to inject through the narrow Presta valves. Not suitable for pumping against air pressures above 25 psi. 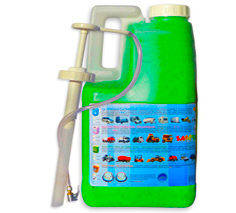 20 Litres High Performance High Speed Grade for Cars, Vans, Light Commercial Vehicles, Motorcycles, Scooters & all Touring Caravans & Trailers, containing 720 units, enough puncture prevention to do 16 to 20 average size cars, 40 motorcycles, 55 scooters & 35 single axle touring caravans. A very cost effective solution for multiple vehicles. 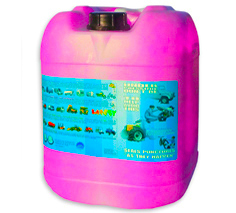 20 Litres Heavy Duty Medium Speed Grade for HGV vehicles, Coaches, Buses & for added protection in Touring Caravans & Trailers, containing 720 units enough for 14 x 22½ inch HGV tyres. This grade is not suitable for very high speed vehicles with steering (cars, motorcycles etc) because of the heavy duty nature of it but will be suitable for touring caravans and trailers for added protection. 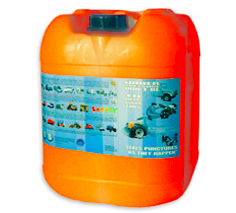 20 Litres Extra Heavy Duty Low Speed Grade for Off Road vehicles such as large construction and farming vehicles and machines, quad bikes, dirt bikes, ride on mowers, fork lifts, motability scooters, wheelchairs, golf course equipment, wheelbarrows and carts. containing 720 units, a very cost effective solution for large or multiple vehicles. 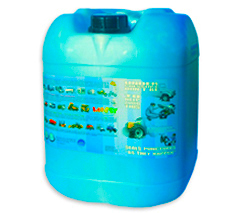 20 Litres Cycle Grade containing 720 units - enough to treat 80 to 100 cycles, a very cost effective solution. Only suitable for Schrader valves because it is not possible to inject through the narrow Presta valves. Affordable at only £5 per wheel. 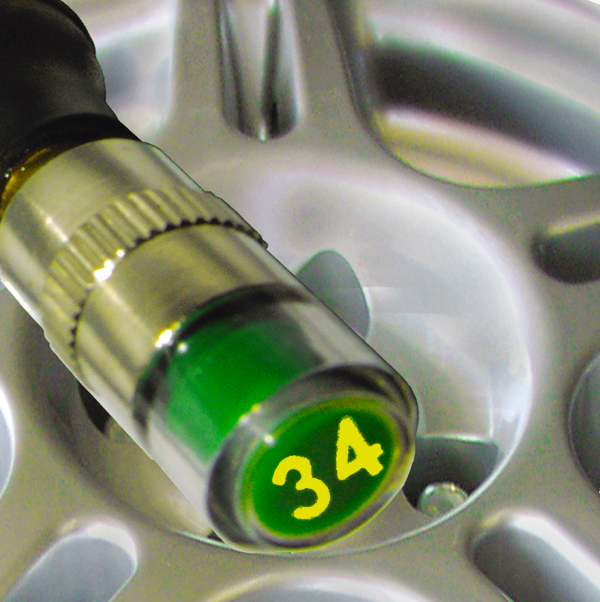 When the monitor is firmly hand screwed on to the valve stem of a tyre that has the correct air pressure the see-through dome at the top is visibly green. With a drop in air pressure of 3 to 6 psi yellow becomes visible and at 6 to 10 psi drop in pressure red becomes visible indicating a dangerously under inflated tyre. Pack of 2 only £11 including vat and delivery. Pack of 4 only £21 including vat and delivery. High and Medium Speed Grades - If a puncture prevention treatment does not cover all of the inner tread and shoulder areas similarly to PunctureSafe (which is one of our most closely guarded trade secrets due to FlexxaGel) then it is useless because it is only doing half a job. Sealants that migrate in a narrow band down the centre of the tread area because of centrifugal forces of a fast moving vehicle, is common with cheap sealants which are mixed cold and without the principles of chemistry. All the sealant grades above are manufactured in a proprietary process using heat, uncommon in the tyre sealant industry. Our less expensive low speed off road grade is manufactured using the same principles of chemistry applied in our high speed grades, and similar to our high speed grade is :- "outstanding at sealing punctures." Need technical help? We have experts who can help you no matter what the situation. Normally ships within one to two working days, with expected delivery being within 2-3 working days from the date of order placement. Shipping charges are calculated based on location, weight of the product including packaging, volumetric weight if applicable and necessary insurance coverage and handling charges. When returning goods, please state your full name and address and the Returns Merchant Authorisation number (RMA) you have been issued with to identify your order. Any order returned to us without this information will be refused. You have until the expiry of seven working days (i.e. excluding Saturday, Sunday, bank holidays and public holidays), starting with the day after the products are delivered, to exercise this right. If you exercise your right to cancel, any money you have paid for your order will be refunded not including the cost of delivering the goods to you and is a minimal of £4 for DIY Kits, or your expense of returning the product. If you wish to exercise your right to cancel, you must also take good care of the products until you return them and ship the product to us. All items must be returned unused in their original packaging and in a saleable condition. All returns must be well packaged to protect items from damage in transit. Any damage that occurs in transit to PunctureSafe UK will be deemed to be the responsibility of the customer and any costs arising from this will be charged to the customers account. All returns should be sent using an insured postal service. We do not accept proof of postage as proof of delivery. Non-stock or Special orders (i.e. those that are have been ordered specifically for you and can not be resold) cannot be cancelled. Customer shall inspect the products within 14 days of receipt, such period being confirmed by Customer to be a reasonable period to examine the products for defects or shortfalls, and notify PunctureSafe UK promptly of any non-conformance. Failure to notify us within that 14 day period will constitute acceptance of the products for all purposes. 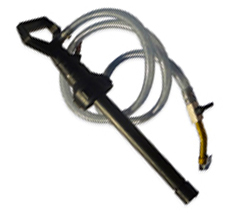 No product may be returned for any reason without the prior approval of PunctureSafe UK. Customers are responsible for returning products to us at their own risk and expense. 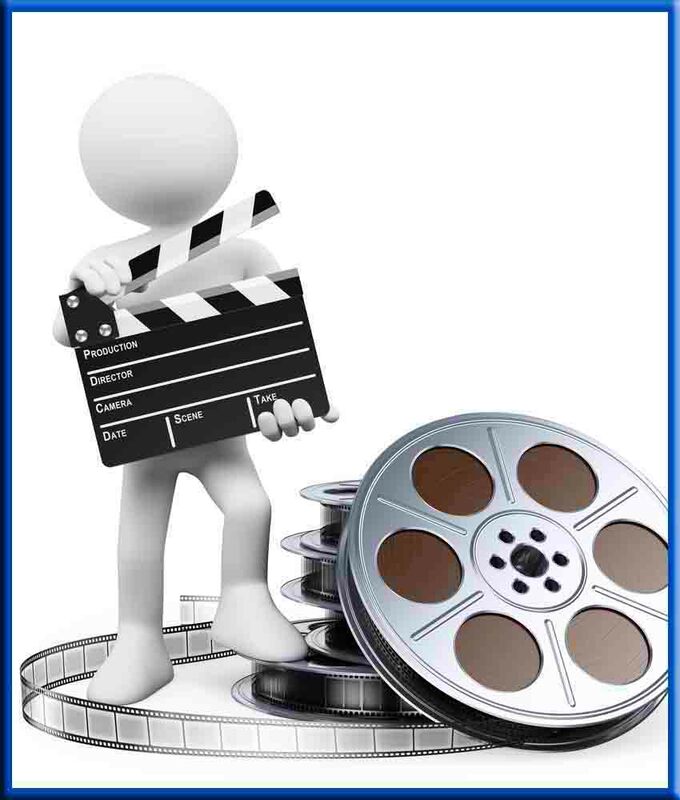 Prior to returning product(s) the Customer must obtain a Return Authorisation ("RA") number from us by e-mailing enquiries@puncturesafe.com or calling +44 (0)1395 233951. PunctureSafe UK shall not be responsible for failure of the delivery service to make on-time delivery. Customer must ship the product(s) to us in the original packaging, prepaid and insured, with the RA number clearly identified on the packaging. Any product(s) returned to PunctureSafe UK shall become the property of PunctureSafe UK. If we determine that failure of the product(s) was not a result of a defect in materials or workmanship within the terms of the manufacturers warranty, we reserves the right to charge Customer for the product(s). We will advise the Customer prior to assessing these charges. All rights reserved. 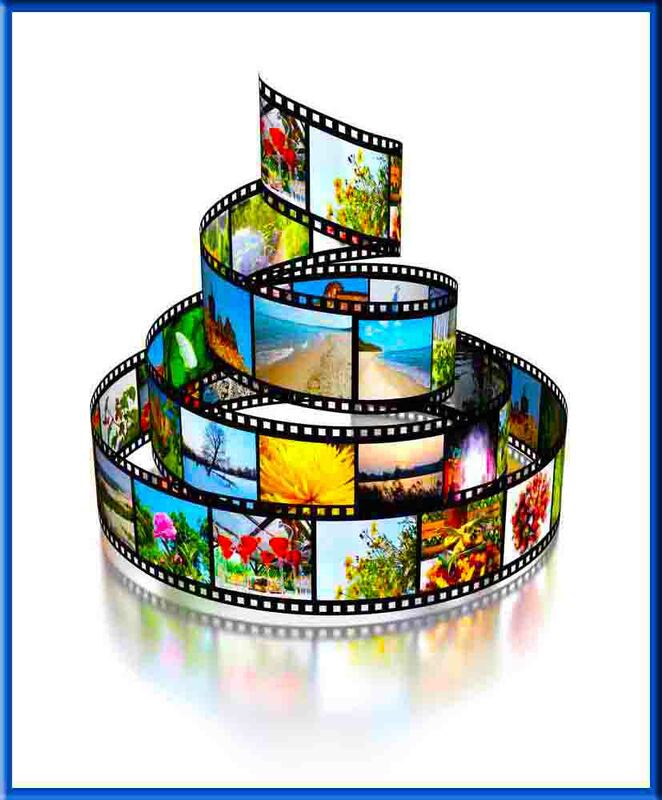 No data, images, artwork literature etc may be reproduced, stored on a retrieval system, or transmitted in any form, or by any means, without prior written consent of PunctureSafe UK. This trademark covers all use of the word "Puncturesafe" or "PunctureSafe". PunctureSafe is a very technical product that has to be manufactured to a very precise process, but because of the ease in which it is possible to alter the genuine PunctureSafe product, ie by watering down, we only provide our products through our authorised dealers, so If you are thinking of listing PunctureSafe goods on online auction sites such as eBay, please ask for our consent in writing before listing our products. 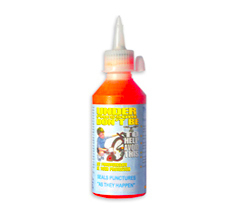 All PunctureSafe products must me sold in the original professional packaging and trademarks that they were supplied with from our official Exeter Warehouse. 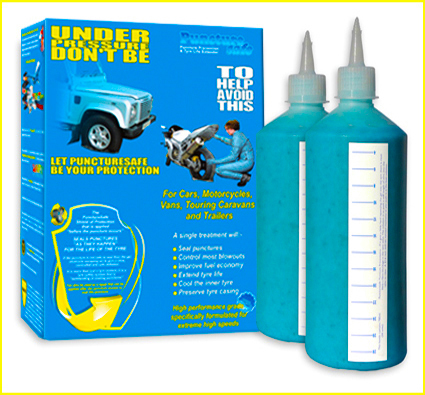 PunctureSafe UK is the trading name for Lowdermilk Ltd, Company registration number 7214291, VAT number 988065272. Complies with the European Union Distance Selling Directive.